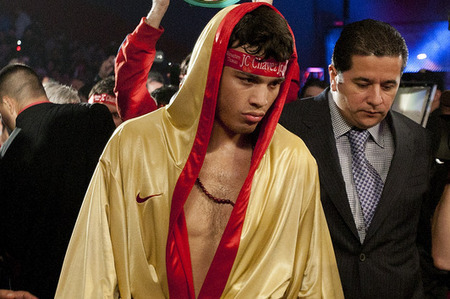 How does Julio Cesar Chavez JR do against the UK’s Middle weights? I give my opinion on how Darren Barker, Matthew Macklin, Martin Murray and Andy Lee do against Julio Cesar Chavez Jr.
Julio Cesar Chavez Jr is regarded by many as a paper champion. His refusal to fight the lineal champion Sergio Martinez is what triggers people to think this way. Since winning his WBC belt by outpointing Sebastian Zbik to a majority decision Chavez JR has defended his belt twice against decent opposition. Peter Manfredo JR and Marco Antonio Rubio are the two guys whom Chavez has beaten whilst being the WBC Middleweight belt holder. Zbik, Manfredo and Rubio are all good, but if Chavez JR wants to be considered more than a paper champ and the best in the division, then he has to start fighting people whom are not tailor made for him. Will Britain’s best Middleweights; Matthew Macklin, Darren Barker, Martin Murray, and Andy Lee fall into this category? Or do they have the potential to cause the unbeaten Mexican problems? Let’s see. Matthew Macklin – Macklin to me is almost a spitting image of Chavez Jr when it comes to styles. They both come forward with very little head movement, work on the inside and throw hooks to the head and body. One thing going for Macklin in this bout is the fact that Chavez is renowned for having weight issues at middleweight. One unwritten rule in boxing is that you should always target the body when your opponent has had weight issues. Against Felix Sturm, we saw that Macklin is a very good body puncher. So if Chavez comes into the ring with Macklin in the same condition he did with Rubio, then Macklin has a good chance of wearing JR down and potentially stopping him late. But the Chavez who fought Zbik and Manfredo was in much better condition than he was against Rubio. To sum up, I would pick Macklin to beat the Chavez JR who we saw fight very recently. But the Chavez who won the title off Zbik would be the slight favourite in my view. Martin Murray – Murray showed a good defence against Felix Sturm, but was pushed on the back foot a couple of times throughout the fight. Sturm isn’t known as a fighter who constantly comes forward and makes you work for the full three minutes of each round. Chavez is. And Murray doesn’t seem to have the offence that Macklin has that could discourage Chavez and temporarily keep him on the back foot. I think That Murray will probably take a lot of Chavez JR’s punches on his tight guard, but would end up getting bullied into a decision or maybe a late stoppage. Darren Barker – Barker is a guy who has got the balls to fight the divisions best. Barker surprised a lot of people the night he fought Martinez and for a good chunk of the fight had Martinez in tactical trouble. Barker like Murray, showed a nice tight guard and good defense, but seemed very tentative when it came to throwing a large volume of punches. I don’t know whether this was because he gave Martinez too much respect in the ring, or that he just doesn’t have the offence to match his defense. I would pick Barker to have more success than Murray, but I would need to see Barker fight a top opponent where he showcases a good punch output and punching power before I pick him to beat Chavez JR. I would pick Barker to lose a close decision against Chavez JR.
Andy Lee – Out of all the names I have mentioned on the list, Lee has the biggest chance of actually fighting Chavez. Lee was a name who was considered to fight Chavez this February. But Chavez’ team didn’t want to fight a southpaw. Perhaps they know something we don’t. Maybe Chavez can’t perform against southpaws. If so then he would have big problems against Andy Lee. Lee has good punching power, and a good jab. He showed in the Vera rematch that he can box a disciplined fight and his defence has improved. If it gets late into the fight and Chavez is sweating and breathing heavily, then a couple of Lee power punches could be goodnight Vienna for Chavez JR. Lee at the very least will cause Chavez JR major problems. To sum up, in my opinion Lee and Macklin would have the best chance of taking away Chavez JR’s unbeaten record away from him. Barker and Murray would need to show a more active offense in order to beat Chavez. If Chavez wants to beat all four decisively then he will need to cut out the drinking during training camp, and try not to balloon up in weight between fights. But even with all these problems sorted out he would have problems with all four. Let me know what you think, out of the names mentioned who do you give the best chance of beating Chavez, and why?